Do you know what is in a flu shot? 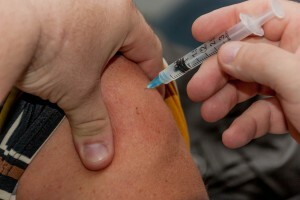 The new flu vaccine is made with armyworms and insects? UGH! The Flublok® flu vaccine is made with insects and armyworms. How’d you like that injected into your kids, spouse or yourself? Flublok Quadrivalent may also contain residual amounts of baculovirus and Spodoptera frugiperda cell proteins (= 19 mcg), baculovirus and cellular DNA (= 10 ng), and Triton X-100 (= 100 mcg). To clarify: baculovirus are viruses that infect insects. Spodoptera frugiperda are armyworms. Will people start having worm-like qualities a la Spiderman getting bit by a spider and developing superpowers? That’s a great comic book story but not real life. Besides what would a person with worm-like powers look like or be able to do? ← Why do so many people use chiropractic for back and neck pain?